The Year 6 girls headed down to Parrswood on Monday evening to compete in the first of five 6 a-side league competitions. The girls were a little nervous at first, but this didn't stop them from playing some good football. They battled hard and came away with 2 wins, 2 draws and 1 loss. Well done to all the girls who played and good luck in round 2! St Mary's RC 1 V 0 St Catherine's (Goal scorer Edwina). Ladybarn 0 V 3 St Mary's RC (Goal scorer Shenna 3). Divine Mercy 2 V 2 St Mary's RC (Goal scorer Edwina 2). Another great performance by the Year 6 girls football team. They cooperated well as a team and played some nice football, coming away with 3 wins and a draw! Well done everyone! St Mary's RC 2 V 0 Divine Mercy (Goal scorers Erin & Edwina). St Catherine's 0 V 2 St Mary's RC (Goal scorers Shenna & Edwina). Green End 1 V 1 St Mary's RC (Goal scorer Erin). The girls improve with every competition that they play in. Another great performance by the Year 6 girls, with the girls winning all 5 of their matches this week - A very well done to all players! Lady Barn 0 V 1 St Mary's RC (Goal scorer Edwina). The girls headed down to Parrs Wood for their final week of competitions. The weather was wet and windy; we kicked off late and unfortunately the competition had to be abandoned when the hail stone came. We did manage to win our 2 games, which will hopefully help us to qualify for the City Wide Finals. Well done to all girls who played and for the resilience they showed during the bad weather. Year 3/4 Football Festival at The Armitage Centre. The Year 4/5 girls football team qualified for the Manchester City Finals and headed down to the Etihad Sports Complex on Wednesday morning to compete. They battled hard and showed great co-operation and resilience, finishing 4th in their group and in 4th position overall. Well done to all players! The Year 3/4 team and the Year 5/6 team went down to Parrs Wood on Monday evening to compete in the Girls Football League. The Year 5/6 team battled hard and managed to win 2, draw 1 and lose 1. The girls are very excited about the next competition in 2 weeks time! The Year 3/4 team did very well on Monday. This time 2 schools turned up to compete. The girls showed great resilience and cooperation and managed to win 2 games and draw 1 - well done! The Year 5/6 team played very well winning 3 out of 4 games. The next competition is in 3 weeks time. The Girls Football team went to Parrs Wood on Monday to compete in the 3rd league competition. Y3/4 – The girls played 3 matches against Acacias, losing 3-2, 4-1 and drawing their final game 0-0. Goal scorers were Kodi (2) and Savannah (1). Y5/6 – The girls also played 3 matches, beating St Margarets and Acacias 2-0, but unfortunately losing 1-0 to St Catherines. Goal scorers were Niamh (2), Jaya (1) and Clodagh (1). Well done to all girls who showed great resilience and cooperation. The Year 5/6 Girls Football team competed in the final league competition at Parrs Wood this evening. They battled hard against tough competition, managing to draw 3 games and unfortunately lose 3. Goals scorers were Niamh & Edwina. Well done to all who played! The Year 5/6 team headed over to LEVENSHULME High on Friday afternoon to compete in a mini tournament. There were 3 other schools competing and we played each team twice. After a slow start the girls found the net and won all 3 of their second round of matches, putting them into the 1st & 2nd place play off. They battled hard, showing great determination & resilience, but throughout the exciting final, neither team could find the net. It came down to a penalty shootout to decide the winner and after going into sudden death, we unfortunately lost 3-2 on penalties. The girls never gave up and showed great team work and cooperation, doing themselves and St Mary's proud. Well done to all players! The girls battled hard in the frosty conditions to beat Mount Carmel 1-0 and Abbott 2-0 (Goal Scorer Shenna). They unfortunately lost their first match 3-0 against Christ the King. All girls stayed resilient and cooperated well as a team to finish 2nd in the league on the day - well done! ​​​​​​​The Year 4/5 team competed in Week 1 of the ETIHAD league. All of the girls battled hard, winning 2, drawing 1 and losing 1 game. Well done! They are looking forward to competing in the next competition next half term. 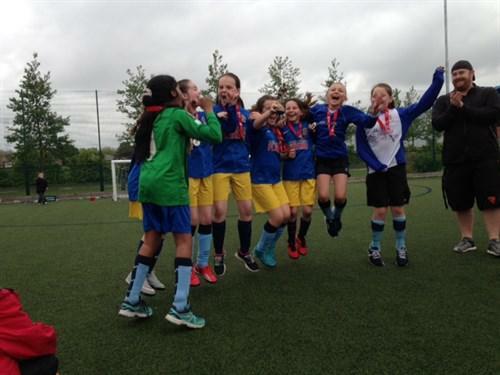 The Year 5 / 6 Girls Football Team went to Whalley Range High School on Thursday 15th June to compete in the City Wide Finals. They won 1, drew 1 and lost 2 in the group matches putting them into the 7th / 8th Play Off match. Unfortunately they lost this game putting them in 8th position out of 135 Primary Schools in Manchester. Very well done to everyone who played. All girls showed great determination and resilience, giving their best in all games, well done! The Year 5 / 6 Girls Football Team finished in the top 2 in their league to qualify for the City Wide Finals after half term! Well done to all who played and good luck in the final! The year 5 & 6 girls are currently competing in a weekly 6 aside league at Burnage High School. 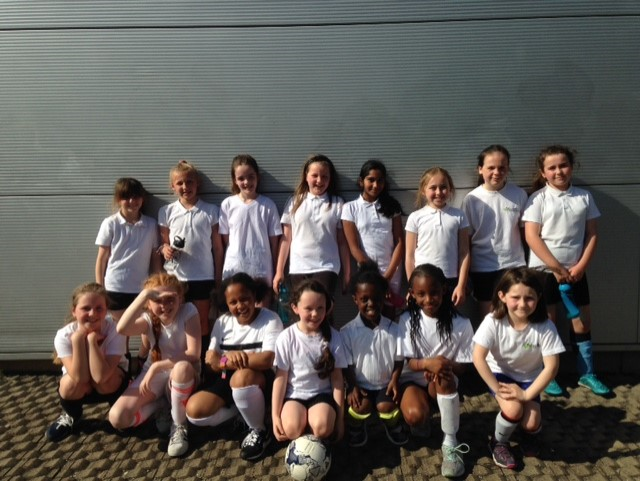 The Year 3 / 4 team and the Year 5 / 6 team have competed in the Girl's Football League at Parrswood High School. They played the first of the league games during the Autumn term, with the Year 5 / 6 team winning the majority of their matches to put them in a great position for finishing in the top half of the league table. The remaining league matches will be played during Spring 2. St Mary's competed in a 6 a-side football tournament at Whalley Range High School. Year 3 & 4 girls played 5 games. We won 1, drew 1 and lost 3. It was a very hot evening and the girls played extremely well, for their first football competition. The year 5 & 6 girls are currently competing in a weekly 7 aside league at Burnage High School. WEEK 3 St Marys Vs Green End Won. The girls played exceptionally well in the finals and deserved to win the whole competiton. Well done to all girls who played!